The weather was so perfect this weekend that we kept all the windows open. We went for bike rides and tried new coffee shops and new-to-us restaurants and had iced coffee for the first time this year. This is my favourite time of year, when everything starts to turn green. I'm starting to feel my annual pre-summer panic, though -- my summer wardrobe, she is not good. I suspect I'll wear this dress from Permanent Vacation so often that I'll have to hand wash it in the tub every night and hang it out to dry. I would love to sew myself some breezy linen dresses, but I have to face it: I won't. Ah well. For a while we've been talking about taking Oreo out into the backyard, presuming that she would absolutely love it. So many things to sniff and investigate! I bought a harness and leash set and on Saturday we carried her outside. She fought it the whole way, and while she wasn't puffy-tailed and scared while she was back there, she really hated it. She hovered low to the ground and meowed piteously, and when we walked her over to the door she ran up the stairs to our apartment. Our fantasies of backyard picnics with little buddy Oreo lying on the blanket won't come true. Sad! Incidentally, I'm really enjoying Geoff's new sunglasses! He had been meaning to get a pair of prescription sunglasses for years, and finally got these Ray-Ban wayfarers. No more squinting! I think those wayfarers look good on everyone, although I have more of a 2140 face and Geoff's is a 2132. I carried my basket around town this weekend and I loved it (and was recognized because of it by a very lovely girl who had just had lunch at Calico Cafe -- hi!). It fits everything I need, including a couple of cameras. One of my favourite things about the 365 challenge is that I have been taking more pictures, many of which end up on Flickr. I used to think that stopping to take pictures of things sometimes got in the way of actually experiencing them, but I'm learning that it takes less than one second to photograph some dogs on the sidewalk as you're walking out of a coffee shop, or to photograph a cat on some rugs. Taking many silly pictures: ça me fait plaisir (my number one criterion for doing most things). Verhext: If you love it, you should use it! So far no one has told me that I look crazy with my basket. If they think it, I don't care! sunshine by sara: I would say they're kind of in between. Sort of a dress shoe / tennis shoe hybrid! alice: Thanks for the information. I bet a lot of people probably think I'm on my way to a picnic when I have my basket! I don't mind. Picnics are great! Kate: Oh man, I hate when that happens. I hadn't even thought about practical applications! SwanDiamondRose: Of course! Yeah, I have to put all those leg raises I've been doing in yoga class to use somehow, you know? Haha. I love them! Thank you! Erandi: Thank you! I might have to come back for another pair. Annabel: Yeah! They're perfect! I hadn't thought of the white but after seeing your picture, I'm thinking about them for sure. Look how adorable you are! I always dread the summer wardrobe. I never want to spend money on it (since it's so short here!) so I always look like a slob which is not unusual for me anyways:)! Aww, poor Oreo! It's probably just as well, though. Our cat is an ex-outdoor cat and bolts for the open door every chance she gets. I live in fear of her taking off and becoming a drifter. I just made a linen dress, picture light grey leggings and white oxfords from golden ponies! I'm sure once Oreo has some more time outside he'll get used to it and your dreams of having picnics outside will be fun for everyone! cats on a leash totally make me giggle. we have have two picnics with our dog and she's sits with us on the grass. it's been great. I hope to make some dresses too. we'll see. Poor Oreo. I know what it's like to have fantasies of taking your animal friends with you, only to have those hopes dashed. I got Flojo a "feather tether" a while back so she could go camping with us, but she was so scared she hid under the bookcase. Camping with Flojo is a no go. That leash, that is too funny. Adorable. I love you with your basket! You look adorable, of course! And I am now leaning towards the Chloe's! That Permanent Vacation dress is amazing, you should definitely wear it everyday this summer. 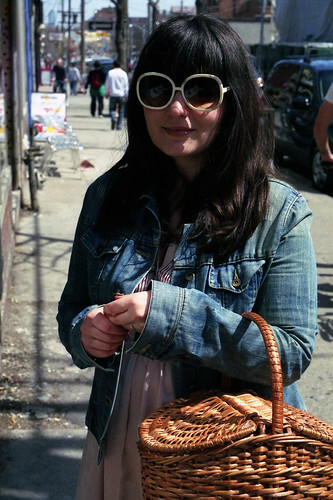 Not to mention, you are forever chic and cool with your denim jacket and your basket. Your cat will get used to being on a leash in the back yard, and come to crave it. They do always react badly at first, but then will gradually calm down and enjoy the experience. poor Oreo! My cat Gatsby is like that- he thinks he's so tough, but if he's brought outside for any reason, he's utterly terrified and demands to go back inside, where he can lord over the furniture. And what a fantastic basket! that permanent vacation dress has such a lovely color pallet/print! so pretty! Your the cutest things EVER! Ahhh, now I'm officially excited about the warming weather. The dress...the basket...the glasses...you're doing it up right! I had the same belly-to-the-ground experience with my cat, and it was more the harness itself that was bugging her. She developed a love of exploring the backyard on her own terms. If you've lived in that place for a while (and she has her claws), Oreo may enjoy exploring in the same way...the dream of family picnics may not be over just yet! make a linen dress anabela! dooo it! that permanent vacation dress is amazing tho. it sounds like such a perfect weekend *sigh*! My cat, Breakfast, acts the same way when I take her outside on the leash. She begs and begs to go outside but then once outside just meows to go back in the house. I think part of it is that she isn't used to the harness. I think if we keep trying it and rewarding her she will come around. I hope you are successful with getting Oreo outside with you too. I love your blog, btw. I tried this with my cat too - it didn't work out so well. I guess leashes and cats don't mix. I still can't get over your Birkin basket. Oreo still might get used to it. i used to walk my last cat because she was so crazy and we didn't trust her outside by herself for a loooong time. she slinked out of her harness at first, and slunk along the ground too. but eventually didn't seem to care as much. it was a partial success i guess. i used to not get so scared of letting cats outside but now it scares me. hmmm. Oooh, look at Oreo on the leash. She looks so cute! 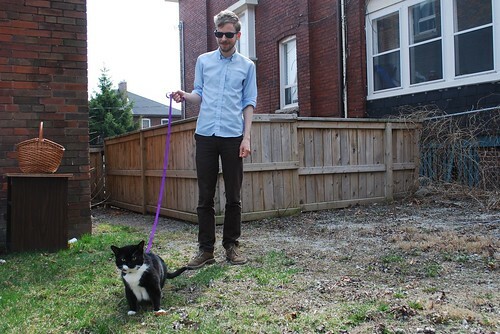 In the summer our neighbours take their cat out in the backyard on a leash. He was a little scared the first few times but seems to like it in small doses now (about 10 mins at a time). PS. It was so nice meeting you and Geoff on Saturday! Hope you had a lovely afternoon wandering about.